The games industry is a strange place, and it just keeps getting weirder. Instead of just releasing a trailer, we get a teaser for a trailer, or maybe an announcement that a teaser for a trailer is forthcoming. Now, there is even more teasing. Now, it’s normal for there to be release dates and deadlines that are known within a studio and only revealed to the public when they want. E3 is coming and many studios are planning on spilling the beans then. However, this is just feeling like a tease of a release tease. I’m glad to know that an internal date has been set – I would hope that this would be ready by now. However, it simply seems unnecessary to post things like this when further information isn’t available yet. 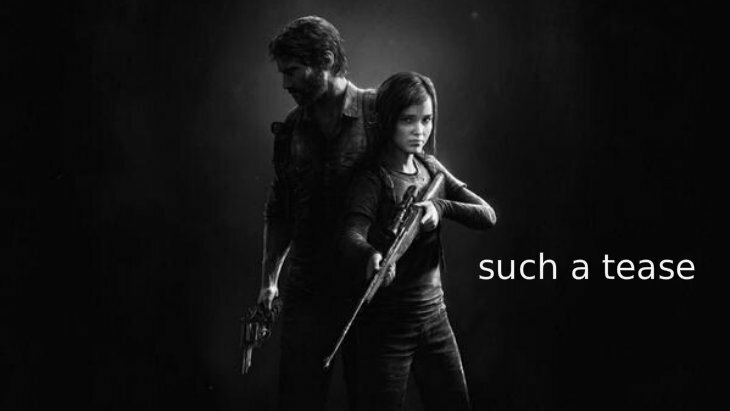 I’m glad that The Last of Us will be coming to PS4. It’s a great game and for those who missed it on PS3, it’s the perfect opportunity to play it with the improved controller and experience. However, it is getting irritating to see how many games are getting ported to the new generation; I know it’s still early on in the generation and this is the quick and easy way to build a library, but I’d still rather see games that were specifically build to work on the new architecture. Are you planning on replaying games as they appear on the new consoles, or are you using these upgraded ports as an opportunity to play those games you missed out on the first time around?